interdependencies in multi-layered p2p systems. 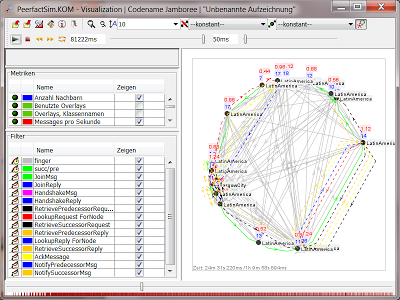 The simulator is written in Java, is event-based and mainly used in p2p research projects. The simulator has been developed at the TU Darmstadt at the Multimedia Communications Lab (KOM) under the guidance of Prof. Dr.-Ing. Ralf Steinmetz. It has been further extended and maintained at the University of Paderborn (UPB) and the University of Düsseldorf (HHU). 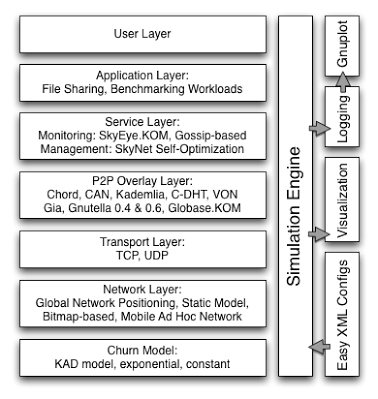 The Community Edition of the PeerfactSim.KOM simulator has been initiated in July 2011 to support timely dissemination of scholarly and technical work which is created by the users of PeerfactSim.KOM. 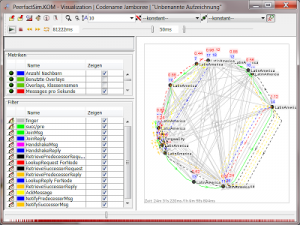 The team at the University of Düsseldorf and the University of Paderborn just published a new version of the simulator! For questions regarding this fork, please visit our Forum. Research on peer-to-peer (p2p) and distributed systems needs evaluation tools to predict and observe the behavior of protocols and mechanisms in large scale networks. The main development of PeerfactSim.KOM started in 2005 at the Multimedia Communications Lab (KOM) and is driven since 2006 by the project DFG FOR 733 – QuaP2P, which aims at the systematic improvement and benchmarking of p2p systems. 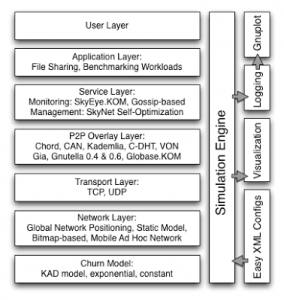 Further users of the simulator are working in the project DFG SFB 901 – On-the-fly Computing aiming at researching p2p-based service oriented architectures. Both projects state severe requirements on the evaluation of multi-layered and large-scale distributed systems. This website offers a forum, as well as code and documentation platform for users of PeerfactSim.KOM.